Essential plot rundown: Katniss must fight for to the death in a yearly competition. Before I get started, I'll say that I did read the books, so I am slightly biased. However, I always try not to judge a movie based on its book because they are two totally different mediums. But, then again, there are always good adaptations and bad. I think I'll start from the beginning of the film: it was horrible. I remember thinking Wow, if the whole movie is like this, this is going to be a waste of 2 1/2 hours of my time. The whole things happens so quickly that there is no character development. I didn't get to care for Gale. (I barely knew who he was). And when Primrose was selected, the only reason I cared was because she was a 12 year old girl going to a death match; not because I cared for her specifically. It could have been any other little girl and it would have had the same impact. 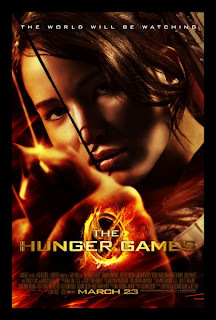 Katniss also has a pin that is suppose to have some kind of special meaning. But it has none; it added nothing to the story. Katniss buys it for Prim and Prim gives it right back 5 minutes later. She takes it into the arena with her, but for what purpose? So she can look at it and think I bought this for Prim, but she returned it before I left. It would have been more meaningful if Prim kept it, that way it would have been a reminder of Katniss; but in the movie it's a reminder of nothing. (I don't know why I'm making a big deal out of this; they only show the thing two times). But, probably the worst part (because it is always present) was the cinematography. It is way too shaky in the beginning, almost nauseating. There is a time and a place for handheld, shaky shots. But people standing around in a big group is not one of them. It only bothered me in the beginning; the rest of the movie was fine. So, I don't know if I just got use to it, or if they used it less or because there was actually some action going on to merit its use. One last thing before I move on to the rest of the film. 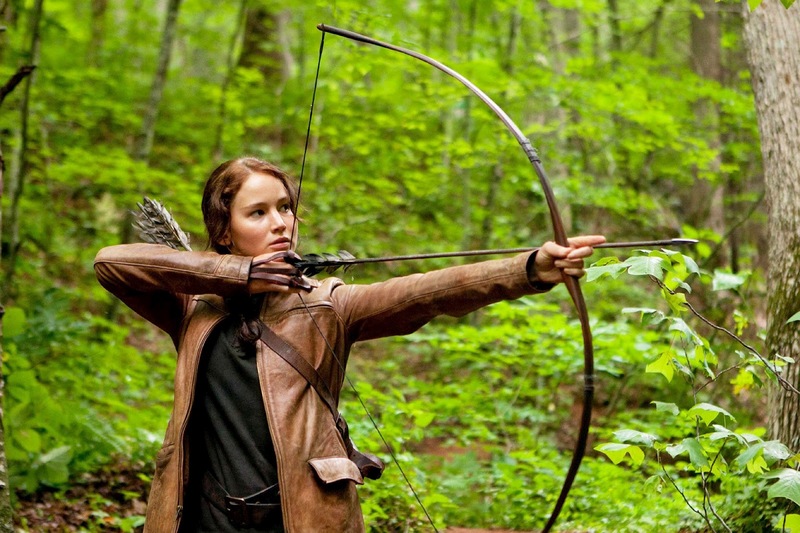 When Katniss volunteers, her district gives her some kind of hand gesture. In the book (if I remember correctly) it had some kind of special meaning. But that is not explained in the movie; so it just comes across looking kind of weird. Ok, let's move on. When the competition first starts, there is a fight for supplies. And this fight was surprisingly bloody. I was expecting violent, but not blood. When people get stabbed, there are blood spurts and blood on the weapons. Usually PG-13 movies only have violence and the lack of blood is what separates them from R rated movies. (From my experience that is how it seems to be). So, yea, the blood came as a shock. I thought most of the actors did a good job. But the one that stood out to me was Josh Hutcherson (who plays Peeta). There were a few parts where his acting was subpar. But, the main thing was he came across as a super likable guy. In the book, he's charismatic and that is what he has going for him. So I felt they did a good job of casting him. I also really liked the addition of the control room. In the book, you know that the competition and the environment was being controlled; but the movie shows you how. That is all I really have to say about that. It just added a cool dimension to the film. Now it's time for another bad. During the competition, a group of other tributes join in a group, looking for Katniss. But the whole time they were laughing and joking around. They didn't seem to be taking the game seriously. They came across more like a group of "cool" high school kids, picking on the nerds as oppose to a group of kids fighting for their lives. They seemed way too lighthearted for their situation. Before, I mentioned that there is no character development in the beginning. This is actually true for the whole movie. I never really came to care about any of the characters. And that is probably the biggest flaw of the movie. There were several scenes that were meant to be emotional. But, because I didn't care for the characters, they weren't. The biggest example was Rue's death. 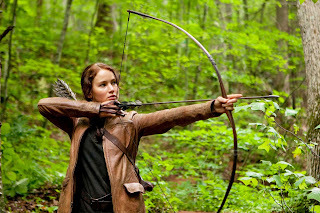 She is helping Katniss, only to get killed. Katniss cries and covers her with flowers. I know I should be feeling something, but I was only introduced to her like 5 minutes ago. Luckily, they followed it with a scene of her family back home and that really did add to the emotional impact. So basically, there were several scenes that I knew were suppose to be emotional and dramatic, but because I didn't care for the characters, I felt nothing. (But maybe I'm just cold-hearted. Who know). But, overall it is a good movie. For the most part, they did a good job of adapting it to the big screen. There were a few things in need of improvement but they don't hinder the movie.